Real Estate « Welcome to Property Source Nation! Foreclosures – Build Your Team First! As an agent, I occasionally have buyers who say they want to buy a bank foreclosure, thinking it will be cheaper, since there are so many foreclosures! But as in all things, there is more than meets the eye with foreclosures! Actually, in Rochester there is not a lot to choose from, the foreclosure market is relatively small compared to other parts of the country. A search of the local multiple listing service of REO, or bank owned , HUD or government owned listings over three counties yielded a mere 64 properties ranging from $499,000 for a 54 multi-use unit to 20 thousand for a two family. There was exactly 1 HUD offering! Some were beautiful homes in pricey suburbs, regular family homes, or investment properties. in either move-in or rehab condition. Are they really bargains? That is up to potential buyers to determine, but how to do that? In other parts of the country, corporate investors armed with cash and the ability to move quickly, buy up large numbers of homes daily. The average buyer has to compete with them, at a disadvantage. The investors looking to buy very cheaply and often; have buying power and large sums of cash allowing them to deal directly with banks. They are looking for homes to hold as rentals for eventual resale when prices climb again. Rochester does not support these buyers since foreclosures here are relatively rare and are generally offered for sale with little discount. Lenders know our market does not have a glut of homes with depressed prices, and as a result, chose to list their foreclosures with agents, in order to maximize their return. While tax auctions can offer relative bargains, this avenue is best left to seasoned investors who can afford to take large financial losses, should a property prove to be in far worse condition than initially estimated, potentially turning “a steal” into a money-pit. Novice investors or home buyers should not be comfortable with the large margins of risk involved here. When sold in a tax auction, all debt/liens on the house are usually discharged (not always so in bank auctions). Due diligence is crucial before bidding, not after! Working with an agent to identify foreclosures is a better choice for the average home buyer or novice investor. Buying listed foreclosure properties offers buyers opportunity to do their due diligence for repairs and title issues. To be prepared buyers should assemble a team as follows: A savvy Realtor familiar with the process, a lender, who has pre-approved their mortgage amount, a reliable contractor available to price out repairs –if the buyer does not know how, an attorney, who must be familiar with pitfalls in foreclosure sales (hint: ask your agent for names) And last, a quality home inspector should be included on the team. Smart buyers work with experts to avoid being stung buying homes that prove to be financial disasters! This is not a time to be penny wise and pound foolish! Finding the right agent is paramount. Working with an agent costs buyers nothing! Sellers pay the listing agent, who in turn pays the buyer’s agent. There is no advantage to not having representation. The right agents understand the ins and outs of buying foreclosures. Full time agents work every day in the market place and are aware of neighborhood trends. If not, they have knowledge of and, accurate tools to see what the trends are. Agents prepare offers, properly structuring them for the buyer’s advantage and protection. A smart agent will insist the buyer line up a mortgage company or provide proof of funds-if a cash buyer; to make sure the client is financeable or has the money to buy. There is nothing more stupid than an agent who takes clients to see properties, not knowing if they can actually buy! The mortgage officer should be familiar financing foreclosures and be able to offer options and suggestions to structure the loan. Sometimes a foreclosure doesn’t qualify for conventional, FHA or VA financing, due to property condition. 203K or “HomePath” loans, allowing buyers to roll rehab costs into the mortgage may be offered. These loans are not simple and require a qualified mortgage officer to explain them to their client, as well as process them to the closing table. Not all mortgage officers think outside the box, with foreclosures they need to. Buyers must be honest with their mortgage officer about whether they plan to live in the property or want to flip it. There are restrictions with some of the loans in regards to flipping, with serious penalties. A quality loan officer can make the difference between a deal coming together or not. Never buy foreclosures sight unseen! It’s crucial to calculate costs to make the home habitable. It may have been completely trashed or stripped out, missing cabinetry, copper plumbing, furnaces, air conditioners, even lighting or moldings. If not destroyed, they might have been removed for resale! Repair costs must be decided before writing the offer. The actual cost of the home is what you pay AND cost of repairs. Remember the property might be bought for $80,000, repairs totaling $20,000 but actual value is only $100,000 even after repairs. This is not a bargain! Financially this home does not work, if the plan is to resell it! In Rochester, this is a common scenario, making flipping of properties pretty hard to do. Once a potential buy has been gone through and identified as a “buy”, quality agents’ supply needed information, including a comparative market analysis. Buyers and agents should research the neighborhood. Is it stable or in a down-ward trend? If it passes muster, the agent helps with pricing. Offering random numbers like half of the asking price, is a waste of time for everyone. Banks are not desperate; it’s a rare situation where a bank accepts such a low offer. A more realistic offer is come to by estimating the worth of the house in good condition. Subtract the cost of repairs; do not exaggerate. Possibly repair costs were figured into the banks asking price, if so, no deduction. An agent can figure if a discount was included. Banks may partially discount, if so, the rest of repair costs should be factored before determining a bid. After subtracting repair costs, 80% of the resulting sum is an offer that usually is seriously considered. For example; if buying a home that should sell for $100,000 in good condition, needing $30,000 in repairs, determine what 80% of $70,000 is-that’s your offer. Buyers should be firm with the maximum amount they are willing to spend. Going off track creates problems! When writing the offer, agents should include several clauses. 1) The right of inspection which is a buyer’s protection , not to ask for repairs, but to uncover major issues that might make buying too costly. If too costly, the clause should give the right to withdraw from the deal without penalty. 2) Utilities be on for inspection, to facilitate evaluation of the furnace, H20 tank and electric system. 3) an exit clause, the offer dies if the appraisal comes in for significantly less than estimated value, especially if paying cash! Attorneys can make additional suggestions regarding protective clauses. It’s crucial to have a real estate attorney on the deal, not just the family lawyer. Foreclosure buys require professionals who are very familiar with foreclosure deals, to catch irregularities and to help protect buyers’ interests. One legal area often over looked, is title insurance. Its recommended foreclosure buyers have their own title insurance policy. Banks always have a policy included in mortgage costs, but this doesn’t protect the buyer! There are two types, one for bank protection, the other for buyer protection. Attorneys should discuss the ins and outs of this topic thoroughly with their client, but will usually do so only when asked. Lastly, a NYS licensed inspector should inspect the property. Agents should suggest several inspectors to choose from. They are a crucial member of the team in determining without bias, repair issues with a property. Additionally inspectors can help prevent further damage to a property, which could be acerbated by not being tended to immediately after buying. For example, broken pipes could lead to serious water damage! A well-chosen team can make a good experience. It’s crucial to stress foreclosures, if not researched and handled properly, can cost time and money. Buyers must be educated and work with their team of experts to find the right property! Buyers should never “go it alone” unless very experienced with this market. Following the rules equals winning the foreclosure game! I Was You! Or Maybe You Were Smarter Than This. Two weeks ago we successfully moved our home and offices from Rochester, New York to Atlanta, Georgia. We sold our house in Rochester (after a year on the market). We are now renting in Atlanta (Toco Hills) while we look for a house. As an expert in Real Estate I thought I’d share some of the insights and experiences. In many ways I felt and behaved like any other Seller and Buyer. In other ways, my knowledge and experience gave me an advantage. You, as Sellers, Buyers, and Agents may find this useful, perhaps interesting. You’re an Expert. Why Did it Take a Year to Sell Your House? That’s an easy question to answer. We overpriced our house. When an Agent does all of the things that normally sells a house and it doesn’t sell. It is one of three things: location, condition, or price. Since you can’t change the location you have to change the price. You can change the condition. If that doesn’t sell it in two or three weeks, then all you are left with is the price. We didn’t change our price hoping someone would overpay for our house because we were not under pressure to sell and move. It is a common mistake for an Agent to say, “This house priced right. It’s just not selling.” That is a naïve and amateur statement for an Agent to make. By simple definition if a house is “priced right” it will sell. When the feedback from people who looked at your house is that, “The bedrooms are too small.” “We want a larger yard.” or any other structural comment; when you get this feedback consistently the true message is that the Buyers are confident they can get that feature in your area for the price you are asking. In other words, the house is overpriced for what it offers. You’re an Expert. Why Did You Overprice Your House? The other factor is that we were not eager. We were motivated but not eager. We were moving to be in a warmer climate closer to our son, his wife and their new baby. A year later with a second grand child on the way and the baby having become a speaking toddler we became eager to get with them before the next baby was born and not spend another winter in the north. Now, It’s Time to Buy. We made two buying trips to Atlanta when our home was not sold. We made offers on two homes. One we didn’t buy after a very bad inspection. The second sold to another Buyer who was willing to pay more. We decided to rent with a clause in the lease that we could vacate to buy a home with sixty days notice. (We paid $800 to have that clause in the lease.) Now that we are here we realize that up until now we were feeling pressure to make compromises in order to buy in a certain timeframe. That pressure is gone and we are more eager and more excited to buy what we really want with less compromise. Buying has turned from a chore into a pleasure. Is this helpful to you? I’m not sure. It’s honest and it’s real. I’ll let you as Sellers, Buyers, and Agents decide what lessons may be learned from it. We are living in the warmth, five minutes from people we love, with no regrets. Hmmm, yes, I believe I can say with no regrets. If we had waited longer to sell or bought the wrong thing more quickly, then I can imagine regretting those decisions. This is the strangest Real Estate Market in recorded history. Buyers can make huge mistakes while at the same time there is tremendous opportunity for them. Sellers too can make huge mistakes while at the same time this year offers more opportunity than the past five. The risk for Buyers is overpaying for a house. The market is active. For the first time in years houses in many areas are receiving multiple offers. That can lead a Buyer to overpay. Buyers who overpaid in 2006 and 2007 are losing their houses to foreclosures and short sales or taking extraordinary personal losses. At the same time mortgage interest rates are reaching new historic lows. During a brief moment last year when it looked like the economy was recovering interest rates quickly rose to over 4% and were on their way further up when the economic slowdown drove the rates back down. This was a clear indication that as soon as there is recovery we will not see these rates for the foreseeable future. Regarding property values we believed we had seen the bottom of the market a couple of years ago and in fact we did. Prices dropped from the 2007 through 2010 and have remained relatively stable since. Residential, owner occupied single family homes are driven by supply and demand. There are not less people. The income and unemployment rates are remaining stable. Residential rental property is seeing a boom in many areas. So, if you are in a position to invest and you are willing to deal with property condition and tenants; that is the place that investors with cash are putting their money. Notice this does not say homeowner danger. If you are happy in your home and have no desire to move to another home, or the need or desire to move out of the area, your home is still your best investment. However, if you are selling and moving you are very likely to be disappointed with the value of your property. Homes are selling in record numbers. However,. few Sellers are happy with the price they are receiving. The danger is in overpricing. Buyers are very well informed about property values. The Internet offers a myriad of websites with information on sale prices and property values. The digital information is more accurate than ever. The days of finding an uninformed Buyer are over. That means that homes even marginally overpriced will receive few showings and no offers. When a property remains for sale for months it takes on a stigma among the Real Estate Agents and the buying public. It is called “Market Wear.” This causes the property to sell for even less. Price your property right at the beginning. Be careful that your Real Estate Agent does not overprice just to make you feel good about them and hire them. You want an Agent who has done a thorough job of determining the most likely sale price. At the same time if you are selling and buying you can feel somewhat better about the disappointing value of the home you are selling because you are likely to more than make up for it with your purchase. This is particularly true if you are moving up to a higher price range. In most areas the higher price range houses have declined in value proportionately more than the modest price ranges. Not all Real Estate Agents or Lenders are created equal. This is a risky market. You want to find the Real Estate Agent who is smart, experienced and responds quickly to you. The market is busy for the best Real Estate professionals. So you want them to demonstrate that they will be responsive to you by returning your communications quickly. You want to find and work with a lender who is responsive and has a thorough understanding of the increasing regulations that impact a Buyer’s ability to finance. Expect the process to be cumbersome and messy. The rules are changing regularly. Even the best lenders are continuously required to adhere new underwriting guidelines. From our economy to our politics there is more opportunity and more disappointment than we have experienced in most people’s lifetime. If you have the intestinal fortitude (guts) and desire to take advantage of a Real Estate market, that market is now. As Alex reported 8/25/2012 on Property Source Radio. Young people are connecting across social networks to start “Sharpie parties” that target foreclosed homes and use Sharpie permanent markers to leave a trail of markings behind on the vacant homes. Merced County, Calif., officials recently reported six Sharpie parties at foreclosed homes that were spawned from invitations posted online. Partygoers—sometimes up to 100 people—are given Sharpie pens and encouraged to write on and graffiti the walls of the abandoned homes. Some of the partygoers, besides marking up the walls, also smash holes in the walls and rip up the floors, Reuters reports. These parties have also been reported recently in Texas, Florida, and Utah. Investigators say vandals are leaving a trail on social networking sites, like Facebook, by posting invitations and photos of the parties that are making it easier to find perpetrators. Banks, on the other hand, have been somewhat reluctant to pursue vandals because they don’t want the unwanted publicity to incite more parties, Reuters reports. As such, “usually they leave the damage and just drop the price,” Andy Krotic, a California real estate professional, told Reuters. As Alex reported 8/11/2012 on Property Source Radio. Foreclosures can offer some home buyers big bargains, with the typical discount on a foreclosure about 19 percent, according to National Association of REALTORS® data from May. But buyers should be careful not to be guided by price alone, housing experts warn. 1. Know the claims on the property. How many lenders have claims against the property? “If a distressed home has been financed with two or more loans then the sales process can be far more complex,” according to an article for RISMedia written by Atlantic Pacific Real Estate. 2. Get financing in order. How does the buyer plan to finance the purchase of the property? “Buyers who use financing must prepare in advance so they can act quickly when a distressed property becomes available as there are often multiple bids on an individual home,” according to Atlantic Pacific Real Estate. 3. Judge the condition. Buyers need to carefully weigh the condition of the property. Some foreclosures require extensive and expensive work, and some buyers may find themselves getting in over their head, if they aren’t careful and don’t have a thorough home inspection done of the property prior. 4. Check for potential delays. For example, is the property already occupied? If so, an eviction may be needed and this could delay the purchase process. Buyers need to be prepared for any potential delays. Thinking about popular neighborhoods in Rochester; Park Ave, Upper Monroe, Corn Hill and the South Wedge come to mind. They are trendy, have lots of stores and restaurants, strong neighborhood associations, and offer a vast variety of home styles. But, did you know there is one neighborhood that offers all of that and more? Located in the North-West side of the city is The Maplewood Neighborhood. This area has been horribly overlooked and additionally, the shrinking of Kodak has not helped. Yet, a revival seems on the horizon for this part of Rochester. People are beginning to remember or uncover the neighborhood for the jewel of the city that it is. More homes are being restored and new businesses are becoming established. Bounded by the Genesee River as a natural boundary on the east side, Driving Park is the southern boundary, Mt. Read Boulevard on the west and the Riverside and Holy Sepulchre cemeteries’ on the north. In this area you will find some of the most interesting architecture in the city, from small, simple homes to grand mansions, this neighborhood offers huge variety. There are three full size grocery stores within a two mile radius and many small “mom & pop” stores and national chain convenience stores, some with gas stations. Varied restaurants are pocketed throughout the neighborhood. Besides city schools, Nazareth Academy and Aquinas Institute are also found here. There are numerous beautiful churches and Rochester’s only cathedral, the magnificent Sacred Heart Cathedral. A newly refurbished YMCA serves the community and there are even three large parks! With all this one would think Maplewood would be the premier area to live. Unfortunately negative publicity began to overshadow the positive points of the area. There are down-trodden pockets, some of which are sadly associated with violence, noise and crime. Sadly, this negative image is what sticks in many peoples minds when thinking about the North-West side of Rochester, including the Maplewood area. What people do not know is that most of the streets here are actually quiet neighborhoods! At this point, I must make a disclosure. I have lived in the Maplewood neighborhood for the past eight years. As a displaced east-sider, I shared many of these misconceptions. I came here because I bought an incredible bargain, a shell of an elegant Queen Anne Victorian. It had good bones and I thought I would restore and flip it. Yet I am still here, because I discovered what a gem of a neighborhood I live in! My greatly restored home is beautiful, roomy and relatively inexpensive! Add into the equation, where else can I find this quality home for the price? I stayed put, and am continually discovering more reasons the Maplewood Neighborhood is the quiet jewel of Rochester. I no longer wonder why the area has such loyal residents, some even are starting to move back in, after leaving for various reasons. Why love living here? First, and foremost, housing prices immediately come to mind. In this area you get more for your money! Most of the old homes were built on a larger scale. While many have been converted to multi-families, there are still large numbers of single family homes that are unscathed by the frenzy to chop grand old homes up into apartments; so, so many years ago. These homes, invested with quality materials, were a cut above in quality to many other homes in the Rochester area. Lots are generally large and often planted with ornamental trees and shrubs. Inside, find chestnut instead of gumwood for trim, doors, and moldings. Leaded and stained (often quite intricate) glass windows are commonly found. Homes range in design from Victorians, Italianate, Colonial Revival, Craftsman, Prairie, Mission, and many other styles. Rare is the street with cookie cutter homes in Maplewood. Single family home prices are ranging from $24,000 to $119,000. The average family home sold in the last year is 2500 sq.ft and cost $60-65,000. 2-4 family homes currently on the market range from $40,000 through $120,000. Two real estate firms operate in Maplewood. They are Platinum Properties and Goodman Realty. Vince Nebbia, a Realtor with 25 years experience opened Platinum Properties at the corner of Flower City Park and Lake over seven years ago, growing it to a full service Realty which also offers property management services. Vince chose to live and work in the Maplewood area because it “is a beautiful part of the city and offers so many unique and beautiful homes”. He saw opportunity in a neighborhood with potential to rebound. Another thriving Maplewood Realtor is Sam Morreale, who had the most real estate deals in the area in the last year. Besides working here, he lives here. Sales in the area have been steady. Ask any Realtor that knows the area and they are all likely to agree that single family home prices are currently the lowest they have been in a year, combine this with low interest rates, this is the time to buy into the Maplewood Neighborhood!!! When people ask what brings a neighborhood back, I tell them several factors come into play. Some of the biggies are properties with unique features making them interesting. A perception of having lots of value for the dollar, even when factoring in property improvements. There must be business infrastructure in place servicing those in the area and providing space for new businesses to come in. The neighborhood has to be easily reached by expressways and major arteries of the city. And preferably there should be unique neighborhood features not found in other parts of the city. Lastly, there should be a strong neighborhood association like the Maplewood Neighborhood Association. The Maplewood area boasts all of the above. yearly Maplewood Rose Festival in June, when the roses are at their peak. This two day festival has vendors, workshops on growing roses and lots more! Holding weddings here has become very popular! The gardens are next to the Genesee River Gorge, where a trail runs alongside ending at Lake Ontario. It’s very scenic and equivalent to Letchworth Gorge in many ways. Yet most Rochestarians have no idea that they live, play or work near this natural wonder. Stand on the Driving park bridge and enjoy awe-inspiring views. On one side you can see the depth and length of the gorge, on the other side; the falls. The “upper” and “lower” falls are visible from the bridge. Walk down the path by the newly refurbished YMCA and you can stand right next to the “lower falls”, feel the ground rumbling from tons of water rushing by and get wet from its spay. After that, meander a path under the Driving Park Bridge to the Maplewood Park and back to the Rose Garden or continue on the trail to Lake Ontario. The Maplewood Park was famously designed by Olmstead. It is one of the most serene parks in the city. Love looking at houses? Take a walk to see the many styles. By Nazareth Academy is 1017 Lake Ave, one of the earliest surviving homes in the Maplewood historic district. Further north enjoy the Vanderbeck House at 1295 Lake Avenue. This home is featured on this years Maplewood House and Garden Tour. Its owner John Acker, bought the property after it suffered extensive damage due to a lightning strike. He had always loved the house and when the opportunity came to put it back to it’s former glory, he jumped at the opportunity. His firm “Cam Real Estate Development“, has beautifully restored the house to it’s former glory, housing John’s office and four apartments. If you love Queen Anne homes, stroll down Lakeview Park. There are many examples of this style here, some rival the painted ladies of San Francisco. Seneca Parkway is known for the many Tudor Revival style homes gracing that street. If you like Bauhaus inspired buildings, check out the apartments at 1043-1059 Lake Avenue. Further north are the famous Thistle Apartments at Lake and Seneca Parkway. This building is a rare example of a Tudor Revival apartment building. These mentioned homes and buildings are just a small sample of what the Maplewood neighborhood has to offer. Its time you get acquainted with Rochester’s Quiet Jewel! Who knows, you might just find your own private jewel, like I found mine! 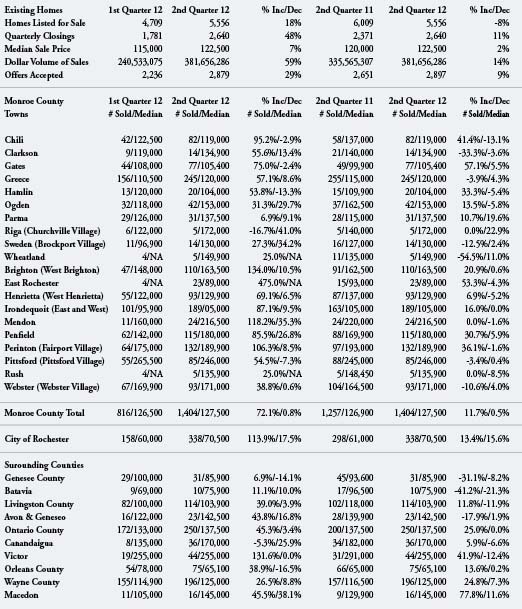 Second Quarter statistics released by the Genesee Region Real Estate Information Services (GENRIS), the information subsidiary of the Greater Rochester Association of REALTORS® (GRAR), indicate that despite a decrease in sales, owning a home in the local region continues to be a wise investment. Transactions for the Second Quarter 2012 showed a 25 percent decrease over Second Quarter 2011, with 2,640 homes sold, as compared to 3,512 during the same period last year. The number of homes listed dropped by 8 percent from the same quarter last year. The Median sale price was up 2 percent to $122,500. “Although closings were down during the Second Quarter, as compared to the same period last year, inventories are also down and with many reports of multiple offers, we’re seeing glimpses of a shift to a seller’s market locally,” said Steve Babbitt, president of the GRAR Board of Directors. This past quarter also showed a modest increase in property values from the Second Quarter 2011, instilling that purchasing a home in the Greater Rochester and Finger Lakes region continues to be a great investment. “With a 109 percent increase in pending sales compared to the same time a year ago, we project a robust impending Third Quarter,” said Babbitt. Most Monroe County towns and villages showed an jump in median home prices year over year, with the greatest gains in Gates, up 57.1 percent to $105,400 and East Rochester, up 53.3 percent to $89,900. The Finger Lakes region saw similar results with the counties of Ontario and Wayne posting 25 percent and 39 percent gains, respectively. “The housing market’s recovery is encouraging, even though mortgage lending and down-payment requirements continue to be a challenge. The local economy is gradually improving, interest rates remain low and affordability is at an all-time high,” Babbitt said. GRAR continues to support the local residential real estate industry by promoting the benefits of home ownership and using the services of a REALTOR® when buying and selling a home. The GRAR® represents more than 2,600 real estate professionals in the Greater Rochester & Finger Lakes region. The term “Short Sale” was relatively unknown before the financial melt down changed the real estate world. Always around, short sales were much less visible years ago. Over the past five years, extreme economic factors converged, bringing short sales into the limelight. Sellers learned short sales are valuable tools when they need to sell their homes but are unable to get as much or more, than what they owe on the property. Buyers are aware of and interested in finding short sale deals. More agents are short sale experienced. And lenders now opt to work with short sales rather than resorting to foreclosure. The increased use of short sale options has been noticed. It seems everyone is talking about short sales and the opportunity for buyers and, yes, sellers! We hear of short sales and foreclosures all over the country, but what about here in the Rochester area? Are we affected too? It turns out we are, but not to the degree that other areas are. There are reasons for this. In real estate, the story is always local. Despite the fact that large cornerstone businesses like Kodak, Xerox and Bausch & Lomb downsized, our real estate market stayed relatively stable, except in some areas and for some types of properties like investment properties in the City of Rochester. Investment properties are one area of real estate especially hard hit with short sales. 2-20 unit investment properties are the most commonly sold as short sales. A combination of unsound leveraging schemes, poor property management and City of Rochester code enforcement issues, creates the perfect storm involving investors. They begin divesting their properties leading to more investment properties available than buyers. Too many properties on the market combined with deferred maintenance on many of these properties, pushes property prices down further. When this happens, the only options can be short sale or foreclosure, depending on the condition and value of the property. Our suburban areas also offer short sale properties in all price ranges. One of my clients, Robin, bought a Perinton property in the Blackcross neighborhood for $60,000 less than what other properties in the neighborhood were selling at. The owners had fallen on hard times due to divorce and job loss. They no longer were able to maintain the property, letting repairs pile up. Sales appeal was lost in comparison to what was available in the area, forcing the property to be priced ever lower, in an effort to find a buyer willing to put money into the property to bring it back up to neighborhood standards. Robin has greatly improved the property and if she needed to sell, would have no trouble doing so. These buys are out there, but be warned, difficult to find. Bob Hibbard, a short sale specialist real estate salesperson in the Rochester area points out short sales have to be priced right to sell. If too high, no offers come in. If too low, the bank might not approve the deal. Some people think “short sale” means fire sale. Not so fast! Hibbard says the average discount for a short sale is between 20-30%. This is proven, by the price paid by my client Robin. She should be able to sell between $170-180,000. Short sales might be priced slightly under current market value, which makes them hard to spot. The owners try to get as much as they can to the property to ensure bank approval of the short sale. Just because someone is willing to make an offer, there is no guarantee the bank will approve the price for a short sale, for various reasons. An appraisal might show more value to the property in question, despite the fact that it has been on the market for an extended period of time and had multiple price drops before the offer came in. The bank may be willing to wait for a better offer to come along, which does happen, depending on the property and its desirability. Desirable neighborhoods, especially higher end suburban areas usually have smaller discount margins than less appealing neighborhoods. Short sales are a long process. Buyers have to be willing to wait out the process. Robin put her offer in and had to wait for bank approval. Fortunately for her, a previous buyer had begun the process, but was unable to complete their deal. Robins accepted offer was able to be inserted into that buyers place, shortening the wait time by three months. The average short sale takes between 4-6 months from start to finish. But be warned some take longer, even over a year! If the price is right and a buyer is able to wait they will get a great value for the price. Why would a bank even agree to a short sale? Mike Smith, a Nothnagle Realtor specializing in short sales explains that in NY State, the foreclosure process is very difficult and drawn out. The time it takes to foreclose is double that what it was a few years ago! Before accepting a short sale offer, the bank will calculate what it will cost to complete the foreclosure and what the property could sell for if foreclosed on, in addition to fees for the sale and maintenance of the property. If the sum is more profitable to hold they will hold, foreclose and sell the property themselves. If they calculate they will benefit more by selling as short sale, they will usually opt for the short sale. Sellers chose to do short sales once they recognize this is a way out of a property they cannot hold on to any longer. Sadly, many who are upside-down with their mortgages do not realize selling their home as a short sale could be an option to them. They think their only option is foreclosure. Hopefully they learn that short sales are an option before losing their homes. Short sales are far less injurious to a persons credit history than foreclosure. Foreclosures take 200 points off credit scores, while short sales only 50. Also, foreclosure must be admitted by a former owner every time they apply for credit or mortgage. Hibbard, points out that short sale sellers can even buy another home in two years while those who opted for foreclosure, wait five years or more. Short sales arise from sellers need as well as the buyers and lenders recognition of benefits to themselves when party to such sales. Short sales are not without pitfalls, but as long as they continue to benefit all parties involved, they will become more accepted as part of the real estate landscape. The term “Short Sale” will no longer have strong negative connotations and will become just another tool in the selling of property. Selling as a short sale helps those who are genuinely in financial distress, benefits the banks in that they have less foreclosures and is a boon to buyers like my client Robin, who was able to afford a home in Perinton, that she might normally not have considered. Short sales, while difficult and uncertain are a great way to buy a property in our area as well as nationally. As Alex reported 6/23/2012 on Property Source Radio. Real estate practitioners in vacation spots across the country say the market for second homes is picking up steam as buyers grow more confident given signs of growth in small businesses. The National Association of REALTORS® reports a 7 percent jump in vacation sales to 502,000 last year, accounting for 11 percent of all volume. The median vacation home price was $121,000 last year, down from a peak of $204,100 in 2005, but agents in some locales say prices are beginning to creep up as the distressed inventory is moved out. Inventory is so scarce in some markets that some real estate professionals report multiple offers; and with prices probably at the bottom, Trulia economist Jed Kolko says people ready to make a cash purchase or who can qualify for low mortgage rates should strongly consider buying now. Check our local Waterfront Listings on Property Source! All Bets Are Off–In Six Months…Who Knows…But now!!! It’s an election year. Have you noticed? Rumor has it that if Obama wins one set of things will happen and if Romney wins a different set of things will happen. Either way, it feels like things will change. Let’s all hope for the better. Although for home Buyers it won’t get any better than it is right now. For home Sellers better means that they will get more for their homes. This is good for Sellers. Better means that interest rates will rise. This is good for the mortgage lenders. But for the Buyers soft prices and low rates, the signs of this struggling economy make this the best time to buy. And Buyers know it. They are out in the market. Houses are selling faster although not necessarily for more money. In some price ranges Buyers are competing for houses; bidding prices higher. In the next price range, just $10,000 or $20,000 higher or lower houses are languishing on the market with little activity. Interest rates are remaining around or below 4% on residential mortgage loans. Mortgage money is available with five percent down or less. The Buyers do need to have steady employment, and a reasonable credit rating. The days of Buyers needing to prove employment, have some cash on hand and credit worthiness have returned. Requiring stability of employment, credit and some cash is not the banks being cautious. It is the way lenders have made decisions since paper money was invented. Bottom line, solid Buyers can get the best rates and buy at what I believe is at or near the bottom of the market. Foreclosure properties are being purchased at a much higher rate as first time home Buyers and investors in market after market are deciding that we are near enough to bottom. This Buyer and investor activity will create its own momentum. As more Buyers and investors choose to buy the demand they create will stabilize and lead to market appreciation. As Real Estate Agents you need to decide if you are comfortable recommending that this is the time for Buyers to buy, that prices may be at or near the bottom. I suggest that we are at or near the bottom and the Buyers you encourage to buy over the next few months will be forever grateful for your advice. The Real Estate market, specifically for residential homes is typically not a speculative market. The vast majority of people buy a house to live in it as their home, not to resell it for a profit. Over the last forty years Buyers have come to expect that their home will build equity and appreciate in value. But, the decision to buy is usually based on factors other than anticipated appreciation. Buyers want to own the space in which they live. The fact that this is a fabulous time to make that decision just makes the decision easier. There is a continuous demand in most markets. People graduate from school, get better jobs, get married and divorced, have children, upgrade and downsize, among dozens of other reasons that new Buyers come on the market. These life events keep occurring. However over the past few years many Buyers have paused. They still want to buy but they are waiting. Historically when there is a time that Buyers are reluctant to buy for any reason this creates a pent up demand. As Buyers realize that it is a good time to buy but not necessarily for Sellers to sell; demand will begin to absorb and exceed supply. Over the next year or two the additional demand is likely to lead to a Seller’s market. Because of the severity and magnitude of the current housing supply this turn to a Seller’s market will likely be gradual. I remember a rapidly inflationary period. I remember it for a funny reason. I used to drink a lot of Coca Cola. One day when I put a quarter into the machine to vend my Coke I realized that it was going to cost me forty cents. Soon after that it was fifty cents and within five years it was seventy five cents. Now it is at least a dollar. This is inflation. Your money buys less and the cost of what you buy increases. If you owned Real Estate during this same period you were very happy because the property you owned in 1981 also doubled in price or more by 1986. That is true even if you didn’t live in a highly populated area. This inflationary period did not discriminate by locale. Are we on the verge of another inflationary surge? I don’t know. I have been reading what I can find on this and it seems to be a largely ignored topic. The people in our government and financial institutions openly talk about having little control. I think about the trillions of dollars worldwide being spent on bailouts. The definition of inflation is when the amount of money in circulation increases and the available goods decreases. It seems to me that is what is happening. If inflation does devalue our money then house prices, along with the price of almost all other hard goods will increase and this year’s Buyers are going to get benefit tremendously. FIRST TIME BUYERS THIS IS YOUR TIME! Another group that I am encouraging to buy now is investors of residential rental property. Investors still have to do their investment analysis. They still have to carefully look at occupancy and vacancy rates. In other words, investors have to make smart, calculated buying decisions. This is always the case. The reason it is a good time for these investors is because the market is soft. Rents are increasing, often by large amounts. As long as there has not been a population exodus in your community, that is, as long as people are choosing to live in your community and employment is stable, the rental property is going to sustain value. At the same time market conditions right now, with more challenging underwriting standards and only those who really need to sell putting their property on the market creates the opportunity all investors are looking for, buy low, particularly those with cash. One of my sons just closed on a new home for his family. My other son is getting his Real Estate license because he is seeing so many people around him buying. My Clients are Real Estate Agents all over the country that I coach and teach. Selling multi-million dollar homes in Long Island, Southern California, half-Million dollar homes in thousands of places or sixty thousand dollar homes in rural and urban areas Real Estate Agent are busier than they have been in years. The market is changing. It will not be this good for Buyers forever. Take advantage now, in six months, all bets are off.